This Hostel is very well located, main attractions, bars, restaurants, clubs and metro station in short walking distance. It's clean and the rooms are light and spacious and the staff was very friendly. Our stay in the Franz Kafka Hostel was perfect. We arrived at ~ 1pm and our room was already ready. The hostel has a perfect location, was very clean and the beds were cool. One problem was, that you have to pay cash there. While travelling Europe, no one wants to carry as much money with them, to pay all of the accomodation in cash. I had to fill in my credit card date while reservating it and it felt weird not to be able to use it for the payment process. Why did I have to fill it in then? We booked 12 h before arrival and it wasn't a problem so we checked in and had a very nice 4 bed room for 70 euros the night. 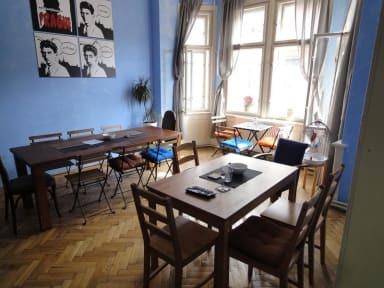 Overall Kafkas hostel is the best choice for a clean, central and quiet stay in prague. Thank you hostel stuff for making our trip that good. Not as pretty as in the pictures, but still nice. Great for visiting Prague and staying in a central accomodation. Die Lage des Hostel's könnte nicht besser sein! Für ein verlängertes Wochenende wärmstens zu empfehlen! Das Zimmer war sauber und geräumig. Von den anderen Gästen haben wir sehr wenig mitbekommen, wodurch wir auch das gemeinsame Bad fast immer für uns alleine hatten. Die Mitarbeiter waren nett. Ich würde jederzeit wieder gehen. Tolle Lage. Sauber. Hohe Decken. 6 Mann Zimmer. Alles normale Betten keine Doppelbetten. Preis-leistung voll in ordnung! Sogar schlösser für das schließfach bekommen :) Zum frühstücken kann ich den angebotenen voucher für das cafe milani unterm hostel empfehlen... 4 bzw 5€ für kaffe, saft und 2 süße gebäckstücke oder 1 sandwich/panini/focaccia. Alles im allen gut! Perfekte Lage- alles zu Fuß erreichbar. Freundliches Personal. Ausstattung: sehr einfach gehalten - kein Spiegel im Zimmer! Simple hostel, but the location is very good.